Dr. Ugochi Ohajuruka was awarded the prestigious Alexander price for Women award by the Common Wealth Association of Science Technology and Mathematics Educators (CASTME) in the UK and also a certification as an Ambassador of Women’s Health by Days for Girls International. Her passion for Medical Philanthropy has taken her to more than 50 communities in the 17 Local Government Areas of Abia State, Nigeria, where she led a team of medical doctors, pharmacists , optometrists, dieticians and nurses to provide free medical services, diagnosis and treatment of diabetes, hypertension, malaria, anaemia, intestinal parasites, chronic pain and sustainable menstrual hygiene education to women and girls. The medical outreach also provided beneficiaries with free breast cancer screening and awareness on early detection of breast cancer. Dr. Ohajuruka also embarked on free eye examinations as well as the distribution of more than 10,000 free eye glasses to people in need. She has distributed over 4,500 free menstrual hygiene kits and books to students in rural secondary schools in Abuja, Nigeria. She campaigns against Female Genital Mutilation in rural communities. 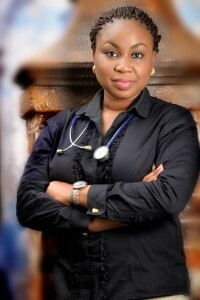 She is a member of the Medical Women Association of Nigeria (MWAN), Association of Public Health Practitioners in Nigeria(APHPN), Christian Medical and Dental Association of Nigerian (CMDA), among many other professional organizations. She has delivered health lectures at various fora and was actively involved in Health Education during the Ebola outbreak in Nigeria . She is happily married with four children.